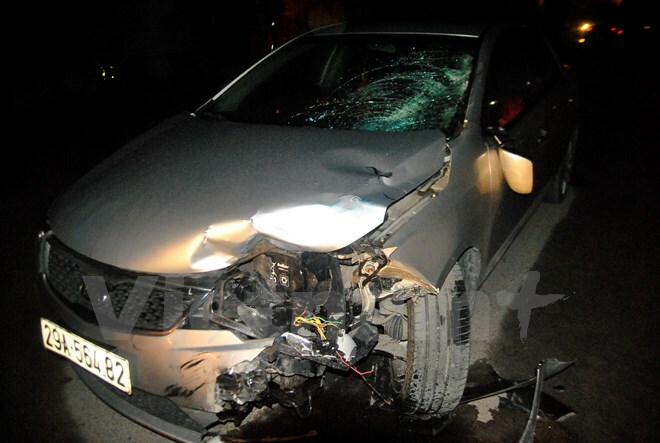 HA NOI (VNS) — A man was killed and another was seriously injured, when a car collided with a motorbike on Thanh Nhan Street in Ha Noi's Hai Ba Trung District late last night. The car was carrying three Chinese persons, one of them being the driver, and a Vietnamese interpreter when it suddenly turned left and crashed into the motorbike that was travelling in the opposite direction. The motorbike, being ridden by the two victims, lost control and hit another car that had stopped on the roadside. The two bikers were taken to the nearby Thanh Nhan Hospital with serious injuries, especially facial injuries. One of them underwent surgery and the other died early this morning.